My comments are in bold following each tip. Make a plan: identify what you want to buy, which stores have the best sales on Black Friday, and what time they open. Make lists…I live by my lists (and fashion journals) . Timing is everything: arrange stores by opening time from early to late. I think Kohl’s opening at 3AM is kooky! I have provided a list of Black Friday Store Hours at the end of my blog. A fool and his money: be wary of Black Friday deals with quantity limits. If a store only has 10 items at that price, go elsewhere. Sage advice, as you don’t want to take down all in your path! To help with hands-free shopping, remember your cross-body purse, as previously mentioned in my It’s all in the Bag blog! Visualize: know where your items are in the store. Kinda tough – if you ask for a map before hand, store security may think you are going to rob them. 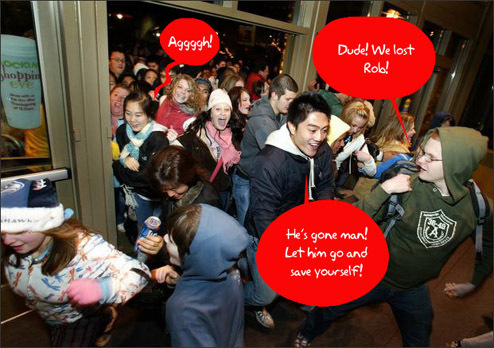 Stay Safe: Previous Black Friday sales were honestly deadly; please don’t trample or shoot anyone! I acquiesce to this! This is good advice for any aspect of your life. Truly! Bring a snack: only amateurs stop at the food court on Black Friday! (Or the bathroom – so go before you leave.) I say a stop at Starbuck’s is a must…and there is really nothing healthy, ever, at a food court, so pack some crackers, a banana, and nuts, and you are good to go. Also, a bottle of water, so you don’t have to spend $2 on it at the mall. As far as going to the bathroom before you leave, when nature calls, not much you can do. Especially after your stop at Starbuck’s. The quiet ones: don’t ignore stores that don’t advertise. They will have Black Friday deals too!! Check online for these, and don’t forget to use your coupons from our favorite coupon websites! 10. Have fun: enjoy your family, friends and deals! Isn’t enjoying your family during the Holidays an oxymoron? 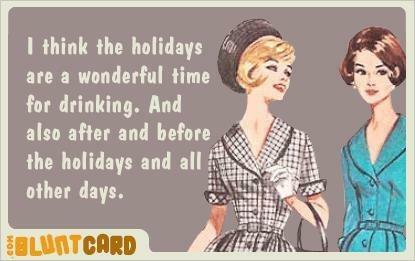 Kidding…it’s my favorite time of the year. Black Friday shopping or not. My friend Nancy says: If you plan and shop effectively with the appropriate targeted “attack”, you can be finished and having a glass of wine with lunch! To avoid the lunch crowds, consider the Nordstrom café – a forgotten gem! If there is one at your mall. 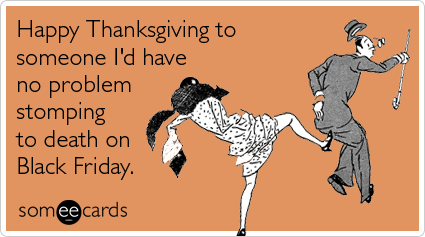 Hope everyone has a Fabulous Thanksgiving, and Happy Shopping to those who dare. Loved it, loved it, loved it! Can’t wait to hit the stores tomorrow! 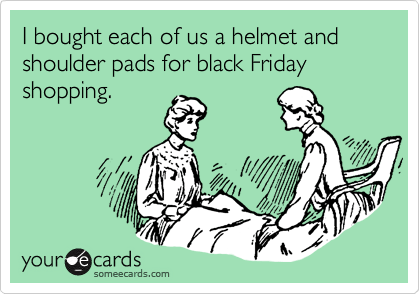 Good Luck with Black Friday shopping to all! It’s over the river and through the woods to Le Le’s house we go for turkey and pumpkin pie…….Happy Thanksgiving to all!